Within Teamwork projects, you can choose to set tasks to repeat at specific intervals. Before setting a repeat, you will first need to make sure you have a due date set on the task. When editing the task, you will see the circular arrow as one of the tabs for the task details, and under this tab you can choose when the task should repeat. 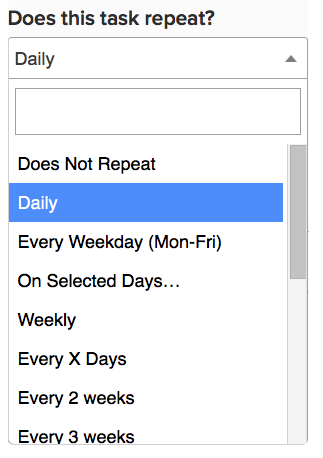 You can set a repeat interval such as daily, weekly, monthly, selected days or custom number of days. Once you have chosen the interval, you can decide whether the task should repeat infinitely or stop by a particular date. Note: Any files attached to the original task will not carry over to each future repeating task. 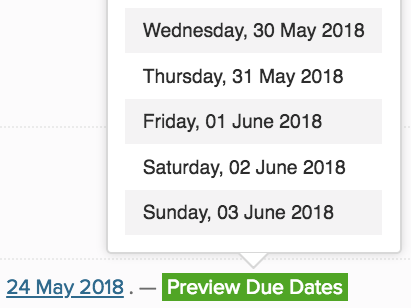 The "Preview Due Dates" option will show you the future dates that the repeated tasks will be due using the preview option at the bottom - just hover over it to show you a list of the dates. Note: The next task in the series will automatically be created as soon as the previous one is marked as complete. On an existing repeating task, you will see the repeat icon beside the task dates. Hovering over that will show you the list of repeating tasks that will be created when the previous one has been marked as complete. However, if you would like to add these tasks to the task list immediately, without marking the previous one complete, just click the plus icon to the right of each one to Create this task now. 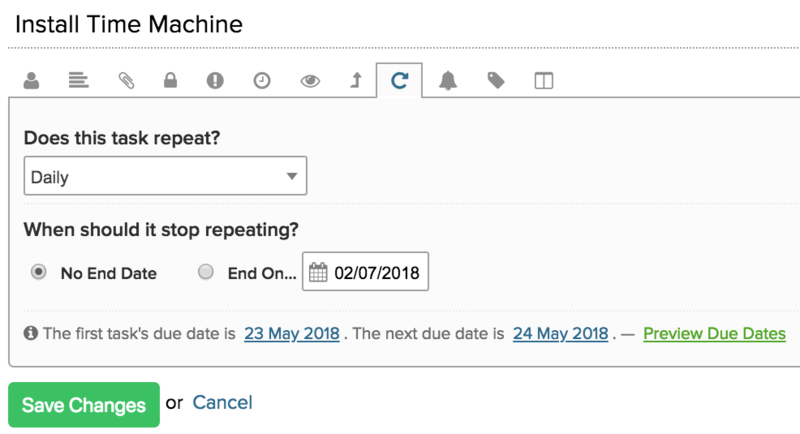 You will need to follow the 'Create this task now' option in order to make all repeats of tasks with estimated time be included in the total estimated time in the workload view. Note: Tasks set to repeat will only display once within the Gantt chart. When a parent task is set to repeat, any existing subtasks will also be repeated along with it at each repeating interval. Note: It is not possible to set a repeat directly on a subtask. Subtasks inherit the parent task's repeat.